If you’re looking for the perfect place to stay with your sweetheart, look no further than our 1 bedroom cabins in Gatlinburg! They offer stunning views and fantastic amenities, which make for a fun and romantic trip for two. To help you plan for your getaway, here are 4 of our best ones that both of you are sure to love. Hook, Line & Sinker is nestled among the trees in a peaceful wooded setting, and you’ll feel like you’re far away from the hustle and bustle of the city. In reality, you’re conveniently located just moments away from the main strip in Gatlinburg. So, you can stay close to all the best restaurants, shopping, and entertainment! Inside, you’ll find plenty of places to relax like the luxurious king-sized bed and the living area with a comfortable sleeper sofa. There are also places to kick back outside your cabin, like the bubbling hot tub or the rocking chairs on the deck. The wooded, mountain location of Sparrow’s Nest makes for some gorgeous photo ops right outside your cabin! You can also take in the scenery as you unwind in the hot tub or hang out on the deck. There is also a Jacuzzi inside where you can enjoy a relaxing soak with a wine glass in hand. This cabin also comes with a fully equipped kitchen, so instead of going out for dinner, you can prepare a romantic meal for two. Enjoy all the comforts of home and more when you and your special someone stay in Duck Blind. 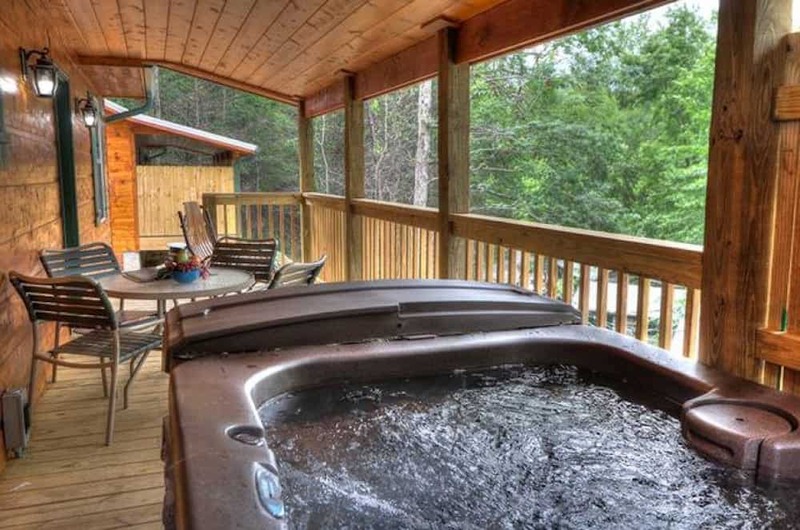 This is another one of our 1 bedroom cabins in Gatlinburg with a hot tub and is perfect if the two of you are looking for a peaceful spot to de-stress and reconnect. With a king-sized bed, a flat screen TV, and a fully equipped kitchen to make snacks, you and your sweetheart will have everything you’ll need for the ultimate movie night! This cabin also comes with free downtown parking passes, so when you go out for date night, you can save a little money. This studio-style, honeymoon cottage is surrounded by the gorgeous national park! Cub’s Den offers both seclusion and convenience, so you’ll be near all the fun of the downtown area and still relax in peace and quiet when you’re at your 1 bedroom cabin in Gatlinburg. You and your special someone can stay nice and toasty spending time together in your private hot tub, in the 2 person Jacuzzi tub, or cuddling up in front of the fireplace. This cabin also comes with a full kitchen as well as a charcoal grill, so whether you’re in the mood for barbeque or a steak dinner, you can make it all here. Now that you’re familiar with a few of the best options for you and your sweetheart, it’s time to start planning your trip! Be sure to check out all of our 1 bedroom cabins in Gatlinburg to find the best accommodations for your romantic getaway.